Some people in our industry are writing long and detailed business plans before they start with an idea or a product. Others just build stuff in order to do what they love to do. I never planned to be self-employed or even run my own company. It just happened somehow by doing what I love. I’d like to tell you a story – the story of how I teamed up with great people to build a side project which led us to become a Web Agency. Building something without a client involved. We loved our client projects but there is the thing when working for clients, you always do what’s best for your client and its users. But we always dreamed of building a product where we were actually our own clients. Something where we could express ourselves and follow our ideas. Back in 2006 finding a job for the web industry was very disappointing. There were relatively few job-listings on the major job-boards in Switzerland. Besides that, when looking for a term like “Web Design” one would end up with a huge list of jobs from SAP consultants to Java Software Engineers. Which aren’t really design jobs at all. The user experience of looking for a job in the web industry was not satisfying at all. Well, back then and still today in our industry job titles aren’t really formal nor protected. Everyone could call themselves whatever they want. “Web Designer”, “Web Publisher”, “Web Developer” and so on. Finding a job that matches what we were looking for was a gamble with keywords. The funny thing about life, sometimes unhappiness can lead to new ideas. Because since we were all unhappy with our day jobs we were obviously trying to find new ones. This was really complicated so we all shared a similar problem and that’s how we connected and decided to change it. We wanted to build a dedicated job-board with consistent content quality to provide relevant job-results for web professionals. Fast forward to summer 2010, we didn’t build anything yet. The concept of a dedicated job-board popped up again in a discussion over a couple beers. The urge to change how to find jobs emerged in all of us again, because the pain in searching for jobs still existed. We decided that it’s time to finally do something about it and started brainstorming on features, names and a suitable technology to be used. We had some big and awesome ideas! All the features we thought would be great! We wanted to change how people are looking for jobs at least for the web industry. But, we wanted to start lean, with a prototype to get the feel for the industry and how a niche job-board would perform with its huge competitors, the well known job-boards we didn’t like. Therefore we focused on how to provide good quality in content and user experience instead of a fancy feature-set or an entirely new concept to present job listings. As we are all web nerds, the site needed to be responsive. Back in 2010 dedicated mobile website and native apps still ruled the mobile world. Responsive websites where still new to the industry. We set our focus in the browser to satisfy the web geek and iPhone fans with a responsive experience across all screen sizes. A static design in HTML & CSS. This was our prototype to talk about the idea with people from the industry. We knew that “Swiss Web Jobs” wasn’t exactly a catchy name and people would probably mean that this is just another platform with SAP enterprise solution jobs on it. So we decided to come up with something catchier and a little less specific. We came up with the name Freshjobs and Velthy designed the visual identity. As Silvan was already really fond of WordPress back then, he wanted to build the job board with WordPress. It was still just a proof of our concept, so we took an existing WordPress theme that had job listing features and started tweaking it by removing unused features and adding new ones. We were already done with what we were experienced in designing and building a web application but we eventually had to make decisions in how to run the job-board. That was new to us. On average it takes 60 to 120 days in Switzerland to find good staff hat’s, why we doubled the usual 30 days duration for a job listing. A job on Freshjobs would last 60 days. By manually reviewing every listing before we would publish it, we would ensure great content quality. When reviewing a job, we check if the content machtes our visitors if not the listing gets rejected. We fix formatting and spelling issues if necessary. We then update the meta information on the listing to improve search engine ranking. It took us approx. 15 minutes per listing, but it was totally worth it, to ensure platform quality and to learn what our customers actually need in terms of features and usability. The curious who followed the link in our tweets would get a little more info about the upcoming platform. So what does this page say? Not much actually, just that there will be a job board from and for people from the web industry. And that one would find jobs like Web Designer, Frontend Engineer and so on. The splash-page was indeed a good preview, it started to gain traction and the community started to notice and wonder about what will come to Freshjobs.ch. We launched Freshjobs on January 31st 2011. In order to already serve content, because a job board is only good with active listings, we asked big agencies for their current openings and offered them a special deal. By the time we launched, we already had lots of interesting job openings on the page. And we had our very first paid listing on day one of launching Freshjobs.ch! A job listing has to fit into these categories otherwise it wont be a fit for this job board. We launched Freshjobs with some features missing. For example the renewal process that allowed companies to extend their job listing was broken. This wasn’t a show stopper to us, because since the duration of a listing is 60 days, we had 60 more days before the first customer might ended up extending their listing. Well, 60 days later and the renewal process was still broken so we ended up doing this manually. 5 days before a listing would end, we manually sent an email to the customer to inform them about the possibility to extend the listing for free. This way we could manage to renew their job by ourselves and our customer didn’t notice that there were no feature for that. We engaged with the customers and could answered their emails personally which made them feel good. We got a sense of what our customers needed so we could later automate the right features. Freshjobs ran smoothly. With a team of four we could easily delegate responsibilites and support requests. This way we managed the job board besides our day jobs. To further spread the word we spent time attending meetups and talked to people about it. To further support the web community, it was clear, early on, that we are going to sponsor relevant events in the industry with some of the money we make. 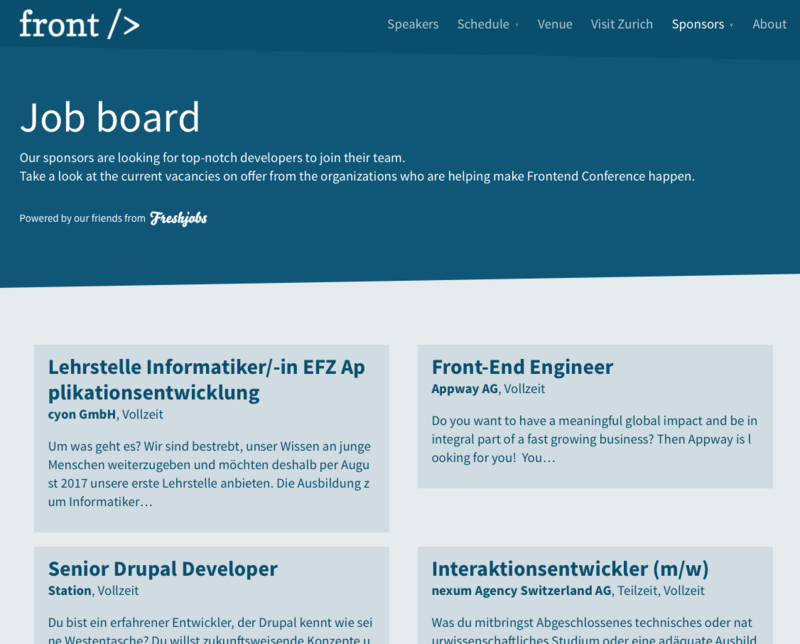 We wanted to build a job board for the web community by people from the web community. It’s part of our philosophy to give something back. So we are sponsoring local conferences with some of the money we get. One of our sponsor package includes that we provide vouchers to the other sponsors of the event. They can post their jobs on Freshjobs for free during the conference. We then create a dedicated feed to put it on the conference website as you can see here in the screenshot from front-end conference in Zürich. We are required, we would provide services in the field of UX, Design and PHP Development. One could book us as individual freelancer or one could do a complex web project with us. Since each team member has its same value to the company we split the company shares through 4. Each of us got 25% shares. In 2014 we planted to rebuild the entire platform. Because we did run the job board based on its proof of concept prototype for over 3 years and it was about time for a rebuild! 3.5 years after the launch of our initial prototype “version 1.0” we finally planed the milestones to build the Freshjobs we always wanted. Some of us did focus more on clients work because they rather worked for client projects and some of us worked on the job board. If we put that on a scale I would say 1.5 person worked on the job board and 2.5 person brought the money in. Over the last 3 years of running a job board we gained a lot of valuable experience and we knew exactly what our customers needed. Most important, we as providers of the platform finally knew exactly what features we needed to maintain and run the platform more efficiently. Because, that’s what we decided to focus on, building features and designing user flows which we knew were valuable to all. We not only wanted to redesign the platform we also wanted to reach more web professionals across Switzerland. There is this thing with Switzerland, a small but very complex country. As you might know the country is divided in three parts the German, French and Italian part. 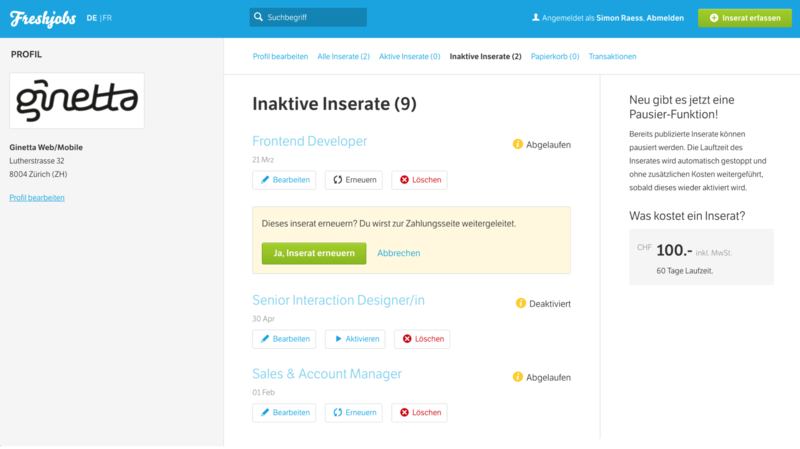 Freshjobs was only present in the Swiss German part. So in addition to the redesign and rebuild of the job board we wanted to bridge the German and French part by translating the platform into French and spread the word in the so called “Romandie”. 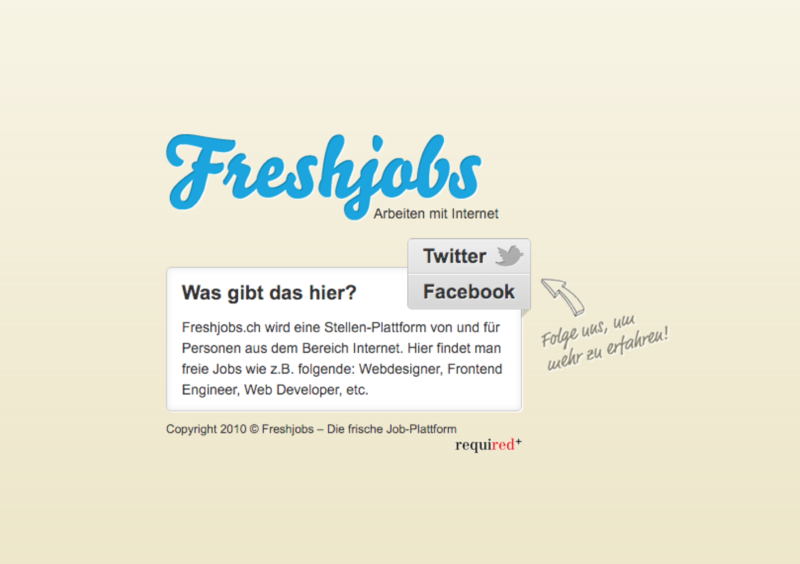 That’s why our mission name for the version 2.0 was “Freshjobs deux” in French and “Freshjobs zwei” in German. 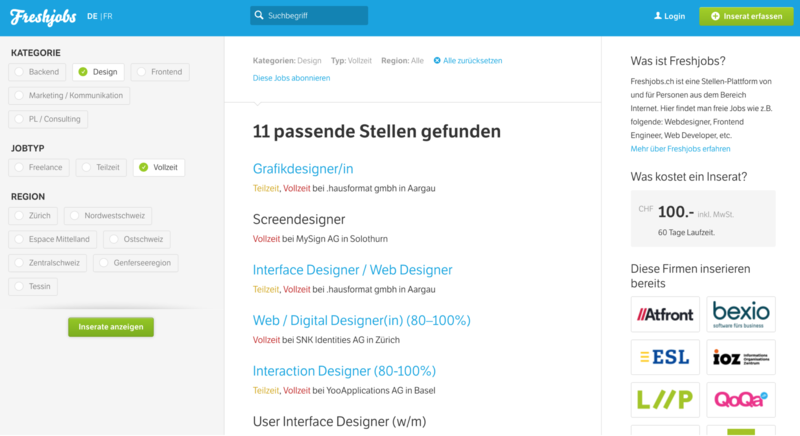 With the subdomain zwei.freshjobs.ch and deux.freshjobs.ch one would get an info page. We germade a microsite explaining our new mission to the web industry. We partnered up with the ux agency :ratio based in Lausanne. They helped us with the translation of the whole application and approached possible companies who would post jobs for the western part of Switzerland. On this microsite one could subscribe to our newsletter in order to be informed about the launch day and of course we again spread the word through twitter. 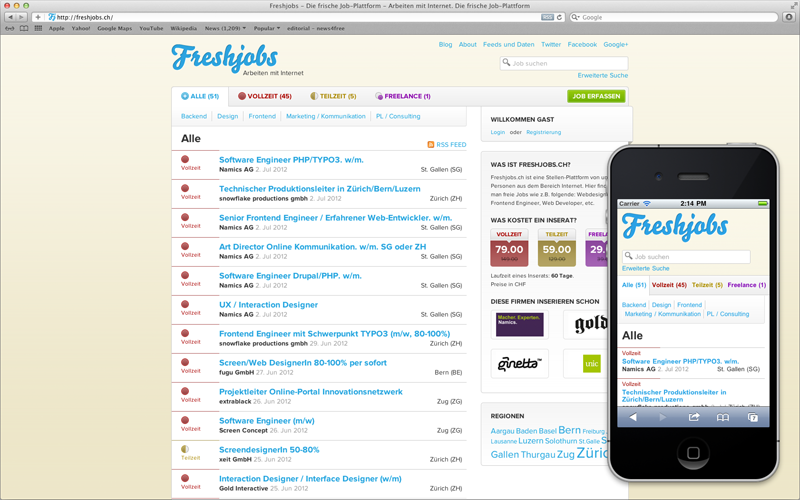 In July 2014 we finally launched Freshjobs with its new design and features. The job board still runs on WordPress. We built a lot of the features in custom plugins to be more flexible in maintaining the board. we send transactionally emails to our customers so that they are always on track with their job status. Since we collect company infos over the past 5 years we built a company index page. Web companies are present with its profile even if they don’t have an active job. 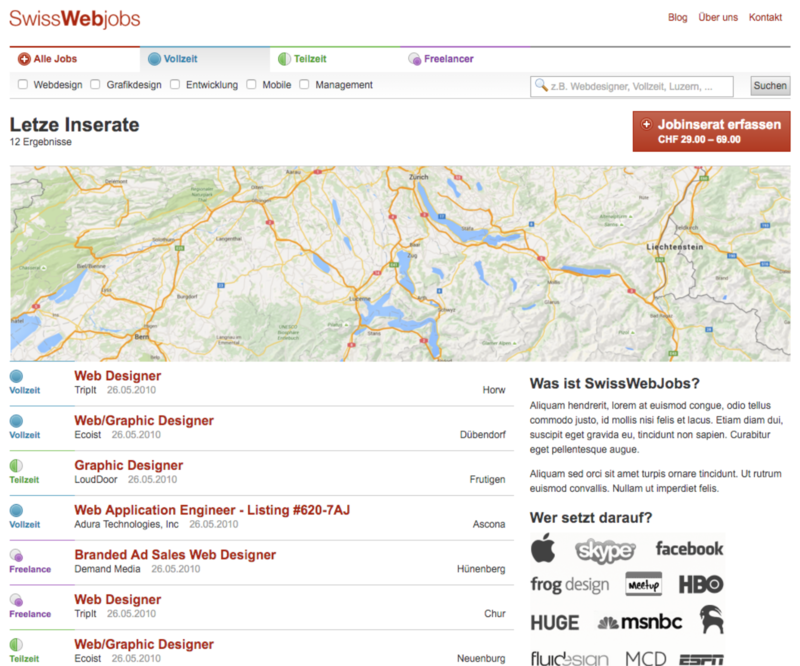 So far Freshjobs lists over 400 companies in the web industry across Switzerland! Yes Switzerland is a small place with many small companies. Ten years later of the initial idea Freshjobs celebrates the 5th anniversary. We learned many things we couldn’t learn if we wouldn’t run a platform like this and we are keen to give our learnings back to our clients projects and events like WordCamps. Since we launched version 2.0 we observe better usability by our customers because of fewer support request. The renewal feature and the automatic email the platform sends for example led to the fact that almost every job gets extended. With the presents in the Romandie the job board also increased in reach and popularity. The idea of a niche job-board for web professionals seams to work and we are very proud. Only do what you do best. Working for clients and products equally well is really challenging. We have so many ideas for Freshjobs but rarely time to work on them. Sometimes it can be frustrating, because we automatically put the agency work first. Because that’s what we decided to focus on and our clients are eventually the one who are paying our bills. We are lucky that the job board is more or less running smoothly. Well, we run the daily business, of course, by reviewing the listings and answering support request. There is always one person of our team on duty. We sometimes switch responsibilities so everyone on the team knows how to run the daily business with the job board. Which makes us more flexible. Constraints forces us to focus: Which means that if we manage to work on Freshjobs we try to work on things that matters. And we are lucky that we work as a team very well one reason why we work so well together is because we share the same attitude towards work and life. Only do what you do best: That’s why we would focus on the things we are passionate about and wont take on projects nor clients which didn’t share the same mindset. Because we truly believe that if everyone on the project is passionate about it everyone will get the most out of it. That’s why we do UX Design, Frontend- & PHP Development, either custom or with WordPress. If a project isn’t a fit to our skills or to WordPress we refer it to another service provider. Which is giving us more space to focus on what really matters to us “working on our passion”. The best product has a vision. When someone uses a product, they’re not just looking for features, they’re looking for an approach. Decide what your vision is and run with it. In the case of Freshjobs its the dedicated job results, less is more, content over features. Let limitations guide you to creative solutions. Constraints drive innovation and force focus – use them to your advantage. Since we didn’t have much time besides the client work we worked only on features which really mattered. Focus entirely on your existing customers. Treat them well and they will become your fans. We engage with our customers by personal trust. We answer support mails in person. Don’t build something for profit only, people can sense it. People can sense it when something is built for profit only. We never put money over our passion. never ever! An idea by itself is worth absolutely nothing, it’s the team that executes on the initial idea that makes the difference. We are a great team and support each other while respecting our individual lifestyle. Because people who are passionate about solving a problem, are the ones who eventually find each other and make it happen. We are still an awesome team and are slowly growing. Thanks to my awesome team!